The West’s politicians and experts parrot three big lies each time they get to talk about Syria. They lie to justify their passive role in Syria’s crisis. They trump up three Syrian “obstacles” that are difficult to surmount. Their first lie is that Syrian society is a jumble of disparate sects and ethnic groups. It is as through the blend is new and did not exist throughout half a century of Baathist rule and a lot earlier. They overlook the fact that Syria has always been a land of diversity and coexistence, bringing together different sects, religions, civilizations and ethnic groups. It always welcomed strangers who gradually integrated its social fabric. For example, the Kilo family to which I belong includes both Muslim and Christian residents of Latakia. And we call Muslim Kilos “cousins” they refer to us as cousins as well. We are united for better or worse and in the good days and bad days. We hail from the Kurds Mountain area, which the regime has been shelling for the past month and a half. Although there are no Kurds left there, if you asked any other Syrian there about their place of residence, they would say: “The Kurds Mountain, east of Latakia.” That’s an area where Sunnite Muslims live in peace side by side with Alawites and Christians from all denominations. My late father, God bless his soul, used to recount the story of a place of worship in the township of Kanasba that was falling apart until Muslims and Christians got together and decided to restore it. It still stands today. The Muslims call it the temple of Prophet Yahya and the Christians call it the temple of Yuhanna (John the Baptist). Sects were not born under the Baath. It is Baath policies that bred sectarianism. That’s one of the problems afflicting our country today. The allegedly secular Baath Party deliberately reared sectarianism in state institutions to turn any quest for freedom by Syrians into a violent sectarian struggle. Instead of noting this and recognizing that current sectarian manifestations amongst Syrians will evaporate once the regime is brought down, Western politicians and analysts insist on characterizing diversity in Syrian society as an insurmountable handicap. Their second fabrication is that the Syrian army is mighty, well trained and disciplined, and has in its arsenal modern and plentiful air defense systems as well as mass destruction weapons at sites dispersed across the country. When blitzed by the United States, Iraq had no less than 625 air-to-surface missile bases, none of which brought down a single U.S. warplane. The United States was adamant that Saddam’s Iraq had weapons of mass destruction and the world’s fourth largest army. The West today is inflating the size, hardware and muscle of the Syrian army to steer clear of attacking the Syrian regime. While I am not urging military intervention in Syria, I am persuaded such intervention was not ruled out because of the Syrian army’s might. Decision-makers on the matter of military intervention simply want the regime to continue pulverizing Syrian cities, towns and villages. Once the destruction is complete, they would start saying the Syrian army is weak, badly trained and equipped and we can put boots on the ground to kick out Assad. Their third lie is that the opposition is divided and impossible to unify. 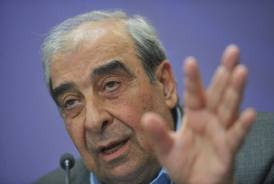 Except that when the Syrian National Council (SNC) was founded, the West was saying the Syrian opposition has sufficiently pulled together as to give national cover for external military intervention. When the SNC urged Western powers to intervene, they backed off claiming the Syrian army was tough, the opposition fragmented and so was the whole of Syrian society. Once Syrian opposition groups got together (at Arab League headquarters in early July) and thrashed out a detailed and all-inclusive roadmap to a new democratic, free, pluralistic and civilian Syria, the Western powers concocted a new lie about al-Qaeda having infiltrated the Free Syrian Army (FSA). They fail to remember that they recently paved all al-Qaeda’s way from Benghazi to Tripoli. They turn a blind eye to the fact that the tens of thousands of people who have taken up arms against the regime are ordinary Syrians who have nothing to do with al-Qaeda. Gentlemen, be honest. Had your interests warranted your intervention you would have said Syria’s is whole in its diversity, its army is crippled and its revolution is untouched by al-Qaeda.